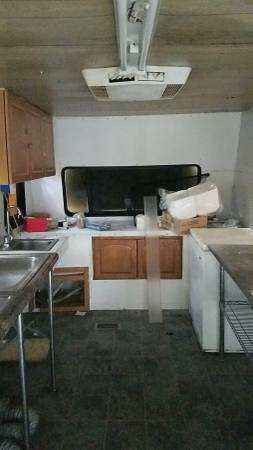 1993 trailer 7’x24’ remodel into a food service trailer. Comes with a grill, steamers that hold 6 pans, two stainless steel tables each 24"x48" with weight capacity of 1500lbs each. Three compartment sink, plus a hand washing sink. Water heater, a/c cold and hot, new 120/240 electrical panel, new 12 gage wire. And 8 gage to connect to electric outlet. It’s has 50% stainless steel on walls and 50 % aluminum. It’s has a 40 gallon clean water tank, and a 80 gallon waste tank. It’s has two freezers and a refrigerator. It has current tags and it’s approved by the state of Iowa in inspections and appeals. The unit has 5 month old tires all 4 new. Any questions call me english Espanol no emails . hablo espanol. Cell and email at contact some one flag the other page I Had please stop doing that this is legit I have pics and if you want come and see it your self. price reduced.